Waitangi; a peaceful, lost haven, whose history shaped the whole of New Zealand. Found 3 hours to the north of Auckland, just 2km from Paihia, Waitangi must not be overlooked. Waitangi is known as the ‘Birthplace of the Nation’ as it was here that the 1840 Treaty of Waitangi was signed between the Maori and the British. Waitangi’s importance to New Zealand cannot be over-stated, it was here that the nation was born, and few birthplaces could be more beautiful. The Waitangi Treaty Grounds are New Zealand’s most important cultural site, and for visitors, it is an essential stopping point to gain an understanding of the turbulent, complex living history of the country. Now a large National Trust Reserve, Waitangi Treaty Grounds offer a captivating stop on a Northland tour, encompassing swathes of the Bay of Island’s estuary, native bush and wildlife filled mangrove forests. Though it is especially known for its history and culture, Waitangi offers an idyllic place to relax and reflect in nature. Waitangi is littered throughout the pages of New Zealand’s history, representing the first sight of land, and trading point for all the early European Explorers and whalers, though with trade and exposure came conflict and anger. So it was here, on the shores of the Bay of Islands that European and Maori leaders came to negotiate, choose a flag and create a new nation. The Treaty House at Waitangi remains a huge draw for visitors from around New Zealand, and far beyond, and is one of the oldest buildings still standing, dating back to 1834. However, this is only half of the story. 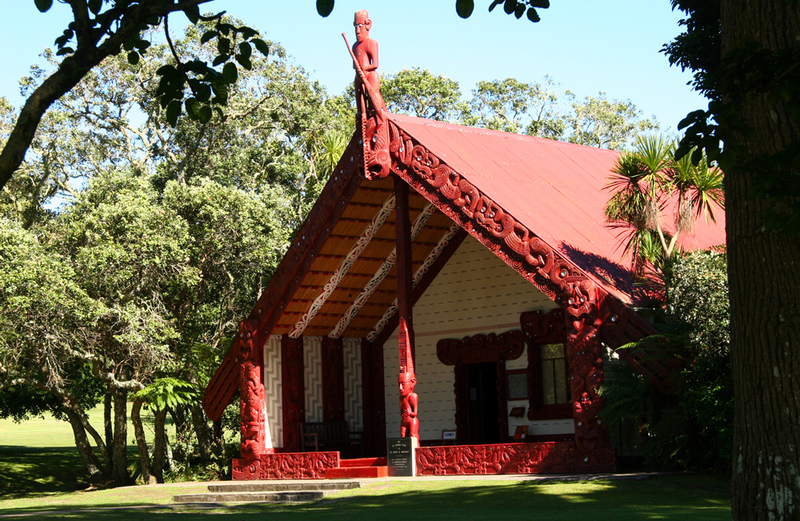 The Whare Runanga, a Maori meeting house built to commemorate the centenary of the Treaty, is utterly unique, showing carvings and folklore from tribes across New Zealand. The Waitangi Treaty Grounds are a spiritual place, where both sides of the treaty are celebrated and honoured. Throughout the year, guided tours are offered, both of the cultural and historic aspects of Waitangi, as well as guided nature tours through the bush. The guides ensure that the subtle messages, cultural symbolism and folklore that is etched into the site are not overlooked, providing a much richer experience. The Waitangi Treaty Grounds are also a great place to experience traditional Maori culture, with cultural performances, feasts and celebrations throughout the year to enjoy. Waitangi’s central location on the Bay of Islands also makes it a sensational place from which to explore all that has made Northland and the Bay of Islands a visitor’s favourite in New Zealand. The Bay of Islandsis famed as one of the most beautiful spots in New Zealand, a huge claim, with 144 islands littered throughout the bay, set against a backdrop of a volcanic landscape, bathed in rainforest. The Bay of Islands is famous for the beauty and nature which abounds in the sea. Swimming with dolphins and deep sea diving trips are among the world’s best, and for serious sea anglers, this is New Zealand’s Marlin capital. There is never a shortage of things to do in Waitangi.